Replace your old or worn pullout cutting board with an exquisite, custom made teak pullout. A tropical hardwood, teak is naturally resistant to moisture, warping and mold growth due to the innate natural oils in teak. Teak has been used for centuries by boat builders and is often used in luxury outdoor furniture due to its ability to withstand the elements. 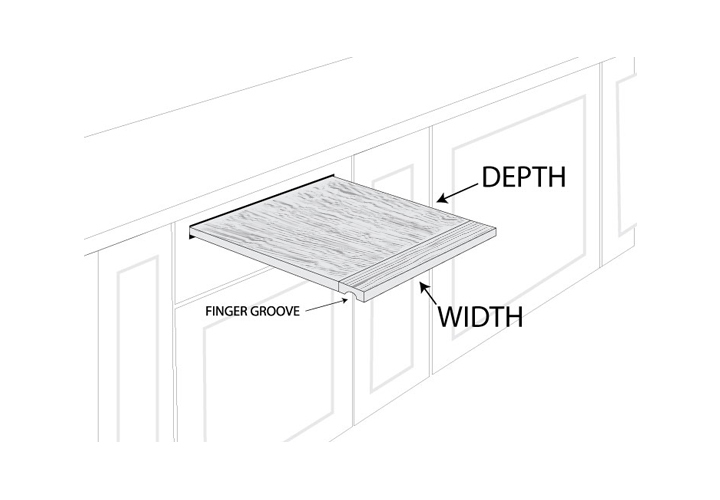 In the kitchen, teak is the perfect choice for an under the counter board for this reason. Unlike generic teak cutting boards, our custom boards are constructed from mature heartwood, the innermost part of the tree, which is hardier and more durable than younger sapwood. While this adds to the cost, we believe that our teak pullouts are top of the line and the best wood pullouts available. Our custom boards come in two different styles. The Straight Grain option is made with 1-2 inch wide strips of edge grain wood running lengthwise, while our Natural Grain choice is made of wider sections of mixed grain wood (4-5 inches wide) running lengthwise and has a more rustic pattern. we also offer our custom pull out boards in cherry, walnut, maple, plastic, and other custom woods are available. Please email us if you have a particular request. We can build your custom board in in lengths up to 42" long by 33" wide and thickness up to 2 inches. 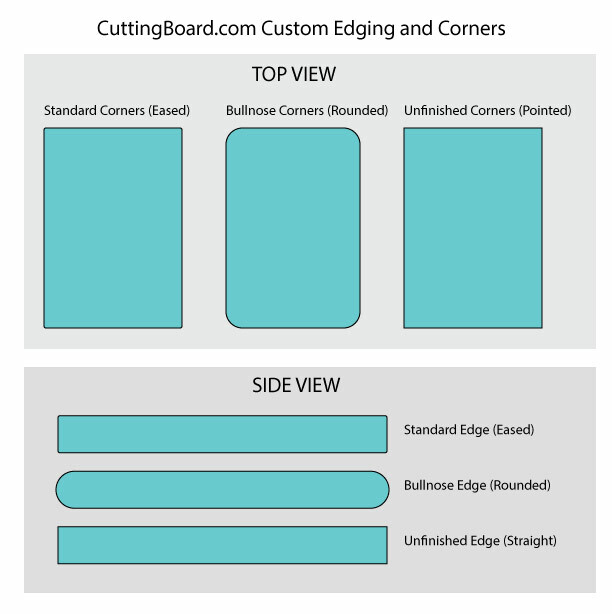 If you need cut outs, hanging holes or even a countertop sized board, just email us at help@cuttingboard.com and we can make it happen! 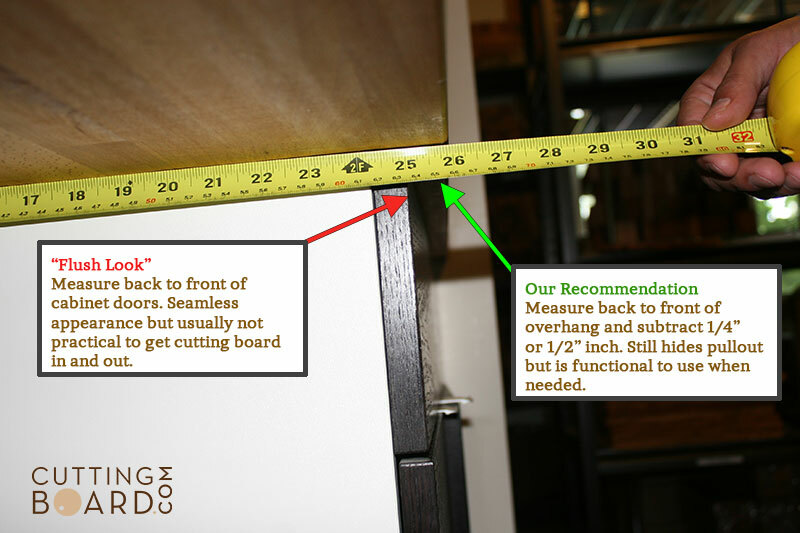 Width Fraction: If your board depth is 15-3/4", then you would put 15" for board depth and 1/2" as your depth fraction. Click the button below to add the Custom Pull Out Teak Cutting Board - Natural Grain to your wish list.